Dyno Records - Page under construction - Will include top spot for serveral different categories! Keep checking back and you could find yourself at the top of the dyno records or if you'd like to try call and set your appointment today! This one came from Gering, NE and belongs to Brian Adams! Record is set at 954hp, this car also came in with a 790tq. Very healthy machine! This car also has three kits of nitrous and capable of producing almost 2000hp to the ground. This record is held by Chad Cowen from Gering, NE with this custom 1990 Chevy Shortbox with a 5.3l iron block and a 76mm turbo and lingenfelter heads with 14psi of boost. This truck made 720hp! This truck is a beast. This one comes right here from Scottsbluff, NE and is owned by Bryce Frossard. 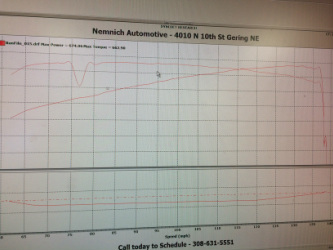 Bryce made over 400hp at 26 psi of boost on 91oct fuel. He is now in the stages of rebuilding his engine and will be running a blend E85 set-up to see if he can hit the 450 mark. One mean 4 cyl at 2800lbs! Record is 406hp with torque coming in at 392.